Adored by millions and regarded as one of the most iconic films of the 90s, Ghost made stars of Demi Moore and Patrick Swayze and helped sales of pottery wheels rocket around the world. 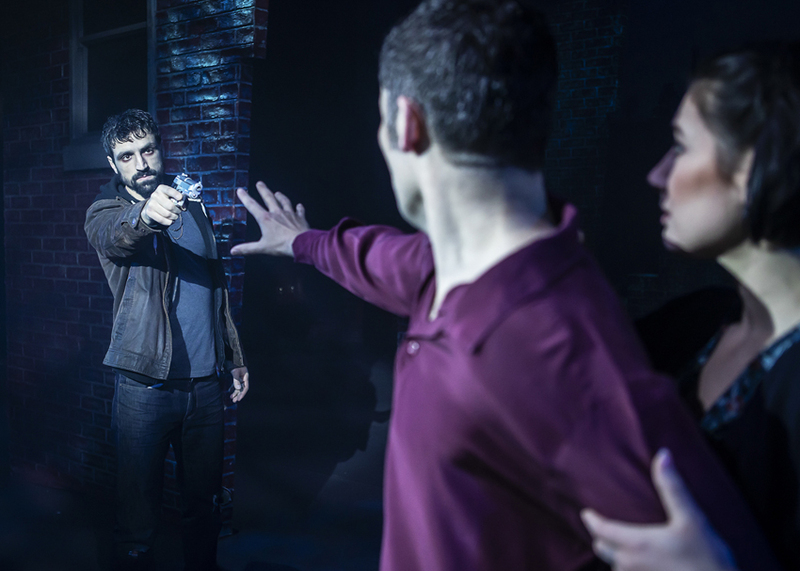 The musical version follows the story of the film faithfully and brings all the original characters to the stage, focusing on the love story of Molly and Sam and the betrayal of best friend Carl. Rebekah Lowings is a strong and commanding presence as Molly who portrays ambition, love and heartbreak in equal measure with ease. Her voice has a good range and has great power and tenderness. Vocally, Niall Sheehy’s Sam was excellent but the characterisation felt weak and undeveloped. There lacked a genuine chemistry early on between Molly and Sam meaning that for large parts of the show, you never really invested in the relationship. The most famous number of the show is of course, Unchained Melody and this song is featured three times during the show. It first features very early on in act one but feels thrown away by Sam strumming on the guitar while Molly creates art. On reflection this was engineered to set up the importance of the song between the couple but without significant work to set up their true love and bond in the text, this felt like a misstep and a deflating way to use a song of that size. By the time it is used for the third time, it feels a bit laboured even though the arrangement by MD Leigh Thompson is much better and as the audience expected. The stand out performance of the evening is from Jacqui Dubois as psychic Oda Mae. 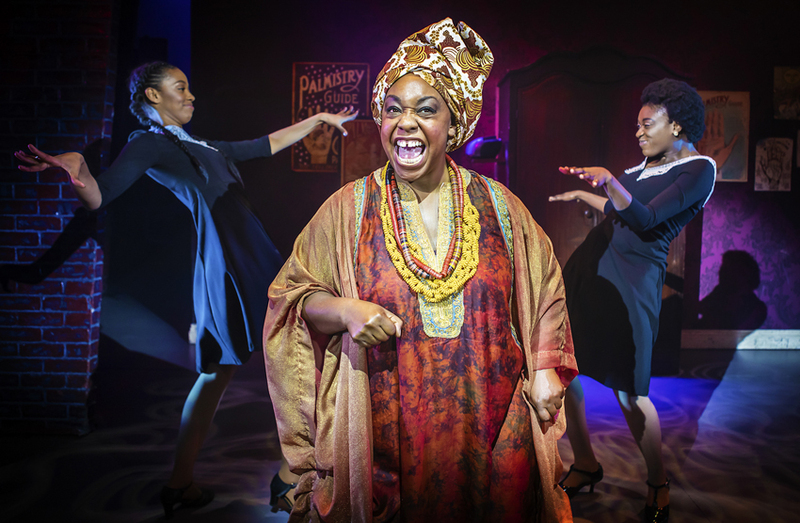 She’s fierce, feisty and quite fabulous and while her performance is close to the character Whoopi Goldberg made famous, it feels more than a parody or pastiche and she commands the stage at every opportunity. Her vocal is strong and comedic timing on the money and lights up the stage whenever she’s on it. She’s well supported by Jochebel Ohene MacCarthy and Sadie-Jean Shirley in her tarot reading bar who provide a welcome shift in pace and musical style. Richard Pinner provides some well thought through illusions including Sam fighting off murdered Lopez which was really well executed. These were used sparingly and this was made all the more effective, while Nick Richings lighting design sympathetically showed the difference between life and death. some laboured, ropey moments in the script with the line “I can see a light, it’s so beautiful” being a particularly jarring and cheesy moment complete with Sam walking to the light. While the vocals were well delivered, many of Dave Stewart’s songs sounded very similar so songs such as “I’m Outta Here” were a welcome change of sound. “Focus” by the otherwise impressive Subway Ghost was a real low point with this number feeling really out of place and not flowing cleanly in the production. 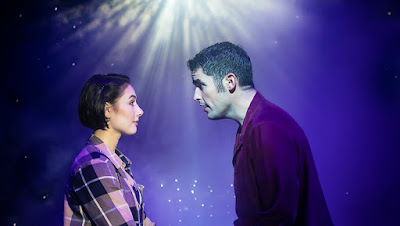 This version of Ghost The Musical is a faithful adaptation of the stage that provides an enjoyable evening out but for a love story, lacks real heart and warmth.